Working Wednesday, working stiff edition. For working Wednesday I present a hearse made from a Hot Wheels Ecto-1. This was a fairly simple conversion consisting of grinding everything off the roof, and filling the large holes there. After a lot of filling & sanding on the roof, I painted it gloss black, and replaced the 1/4 windows with ones made form the sunroof piece(the originals have notches to hold the roof race piece). If I was to do it again I’d probably just fill those panels instead, as they look a bit odd. All in all an effective conversion. 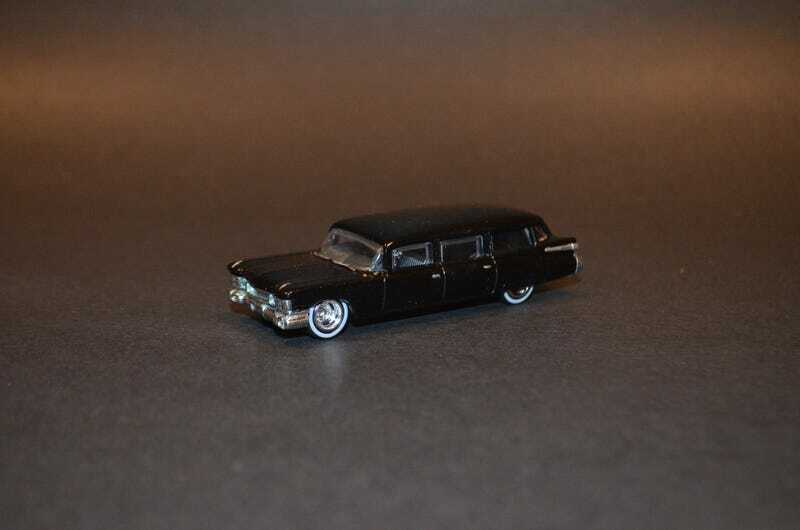 Now that I’ve been sent another Ecto, that one will be turned into a flower car, and I just found the newer Ecto-1 on clearance, so that will also be getting a hearse conversion.